A Navy veteran who posted photos to Facebook of Homeland Security vehicles arriving near Ferguson was fired from his job and accused of being a terrorist, CNN reports. 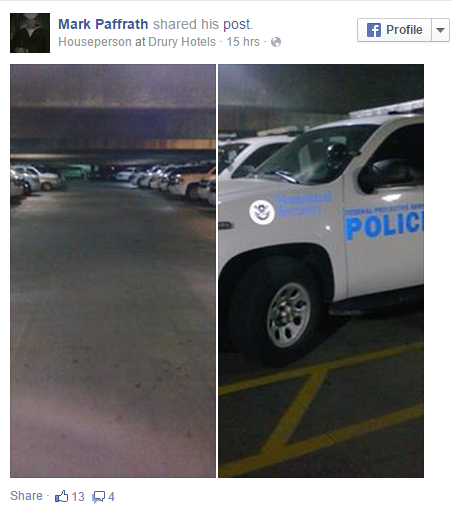 Mark Paffrath worked for the Drury hotel chain where the federal vehicles were amassing in a parking lot when he snapped the photos. Paffrath said his boss was furious. “The head of security for Drury was in there, and he pretty much called me a terrorist, saying that I dishonorably served my country for posting those pictures and videos on Facebook,” Paffrath said. Paffrath said he can’t understand what he did wrong. “You know, it surprised me, and I was rather shocked that they were there. So I took a short video and a picture of the vehicles. I didn’t give any location out,” he said. He was fired on Saturday, two days after posting the photos. What If FBI Was Successful in Exposing Martin Luther King Jr.
Posted: 11/18/14 at 9:08 AM under News Story.